For many, Haiti will conjure up little more than images of the recent earthquake and perhaps stir vague memories of Papa Doc Duvalier, immortalised in Graham Greene’s novel, The Comedians. Haiti was the first independent nation of Latin America and the Caribbean and the first black-led republic in the world. But it is presently the poorest country in the western hemisphere with 80% of the population living under the poverty line and 54% in abject poverty. Its richest 1% own nearly half the country's wealth. "This country is dying. It is running out for fresh water. Less than 2% of its natural forested areas remain; as a consequence, agriculture is devastated. Though wracked with poverty and disease the population continues to grow – and continues to migrate from rural to urban areas, chiefly Port-au-Prince." Haiti is still suffering the consequences of defiance, as Sprague makes clear, probing the aftermath of the 2004 internationally sanctioned coup against Haiti’s first democratically elected government of President Jean-Bertrant Aristide. Aristide, a liberation theologist priest, has the painful distinction of being overthrown twice by military coups, once in 1991 and the second time in 2004. The years following the second coup, in which Aristide was spirited to the Central African Republic on a US military plane, saw some 4,000 political murders and the repression of Aristide supporters and members of his Fanmi Lavalas party. In a Machiavellian twist, Aristide is currently facing accusations that he exploited street children for political gain. "Slavery is alive and well in Haiti. It’s even worse than slavery, really, because at least with slavery you were offered some fringe benefits, as far as housing. In this situation you are offered hard labour and that’s it. If you get enough money to buy a machete so you can chop down a few trees and weave together a hut and pack mud on the side of it, good for you. If not, tough luck. They don’t provide housing, they don’t provide food; they just use them for labour." Sprague documents the specific role of paramilitary groups in the overthrow of then President Aristide's government (elected in 2000 with 92% of the vote). In doing so he exposes an iceberg of intrigue and collusion beneath the surface of which the criminal brutality of these organisations is but the visible tip. We might ask why the poor in Haiti have been victims of political violence for such a long time and why have dominant groups (and governments such as those of the United States, France and Canada) targeted such a small and impoverished nation? One answer has been provided by Noam Chomsky, who has likened the elite networks that undergird global capitalism to a mafia that does not allow even the smallest and most inconsequential shopkeeper to show open defiance. Sprague draws on research by American-born campaigner-writer Randall Robinson, who now lives in self-imposed exile in St Kitts. 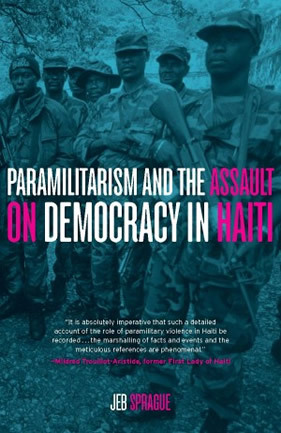 Randall condemned the 2004 coup against elected Haitian president Jean-Bertrand Aristide in his powerful book – An Unbroken Agony: Haiti, From Revolution to the Kidnapping of a President. Robinson has noted that “no one could remember an occasion where the United States and its allies had mounted a more comprehensive campaign to cripple a small, poor country as they had in the case of democratic Haiti”. Sprague’s book is a stark, disturbing reminder, to those born into more fortunate circumstance than the wretched poor of Haiti, of the absolute lack of morality employed by those committed to an ideology dramatically opposed to democracy, human rights, equality and social justice.